Futurama fans are rejoicing. After being cancelled from Fox, then revived in the form of some straight-to-DVD movies, and given another shot with reruns on Comedy Central, the little animated show that could has returned with new episodes. And we didn’t even have to order any Subway footlongs. In celebration of the return (and the fact that the new episodes are hilarious, at least so far), I thought I would take an overdue look at the pilot episode of Futurama. I read once where someone referred to this as “the perfect pilot.” If not perfect, it’s pretty close. When Futurama aired it was “the new Matt Groening show.” Fortunately for us and Matt Groening it is nothing like the Simpsons. The Simpsons does its thing—well—and Futurama does its just-as-witty- but-totally different thing. In fact, Futurama is more original. The Simpsons basically took an existing TV formula and animated it. Futurama mashed up situation comedy, science fiction, 20-something slackerdom, political satire and Y2K fear. In the pilot we meet Philip J. Fry (Billy West), a pizza delivery boy with slouching shoulders and gravity-defying orange hair. His life is as miserable as we, the viewers, have ever thought ours were. He finds out his girlfriend is leaving him as she drives by him in a cab with her new man. He’s good at one thing at least, a 1980s-era video game that allows him to fly through space and shoot stuff. For anyone who ever fantasized that their gaming skills would come in handy in the real world someday, Fry is about to live out their fantasy. Tonight it’s new year’s eve 1999. A newspaper headline reads, “2000. Doomsayers Cautiously Upbeat.” (It’s these simple little gags that fill every moment of the show with humor and make it worth watching over and over.) 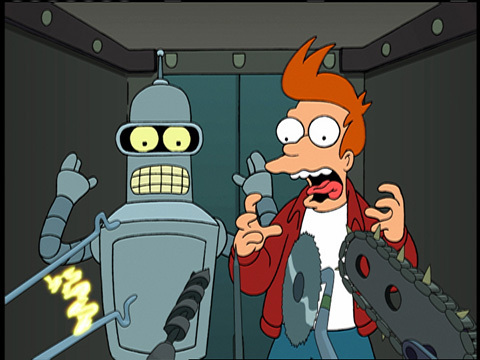 Fry, as the victim of a crank call, is delivering a pizza to a cryogenics lab when he falls into a cryogenic chamber set to thaw in 1,000 years. A montage of the next millennium shows us Groening’s satirical prophecies for the human race. New York rises, falls, rises, falls, and rises once more. There are many details worth slow-mo’ing. Next we meet Leela (Katey Sagal), whose job is to program other people with a chip that determines their vocation. Apparently their system is pretty accurate, because it labels Fry as a Delivery Boy. Leela is kinda hot considering she’s got one giant eye in the middle of her head, and there is no denying that she’ll be Fry’s love interest for the series. (We’re told she’s an alien, but a later episode will reveal otherwise.) We also meet Professor Farnsworth, who hires Fry, Leela, and Bender as his new flight crew aboard the Planet Express. And, voila, Fry is a delivery boy again. Context is everything; he couldn’t be more excited. Thus, Fry and the audience are off on a series of adventures. It is brilliant how Groening can say so much about our own time with a story set a thousand years in the future. Bits of what happened since 1999 are filled in here and there like little warnings. And yet, some things never change. Human beings—and other species as well—will probably have the same neuroses in the future that they have now. This entry was posted in 1990s, 2000s, Animation, Comedies and tagged 3000, animation, bender, billy west, comedy central, futurama, katey sagal, matt groening, new new york, robots, sci-fi by meekthegeek. Bookmark the permalink.